The MDS30 Series has been discontinued. Please see the CDTX-111_CDTX-112 Series as a possible alternative or contact our Flow Engineering department. The MDS30 series is a high performance microprocessor-based benchtop single or dual input controller which offers the flexibility to customize control options. Each unit features automatic temperature compensation, two 6 Amp mechanical relays per controller, and independent programmable 4 to 20/0 to 20 mA or 0-10 V recorder outputs. For ease of operation all calibration and parameter setpoints are programmable through the front keypad. The MDS38 also features two large easy-to-read 23.8 mm (0.5") displays, and can be interfaced with a large variety of Industrial or laboratory pH/ORP electrodes and in-line or submersible conductivity sensors. 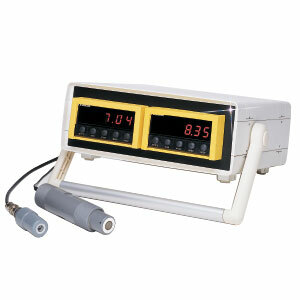 The MDS37 series features single input and output for pH, ORP or conductivity. The MDS38 series features a choice of two independent inputs for controlling conductivity, pH, or ORP. Mix and match the controller inputs to match your specific parameters. The recorder output feature for both series allows the user to interface the controller directly into a wide variety of process recorders and Data Acquisition systems for permanent recording of process parameters.